Olaf Baumunk is a Bioplasmatist and runs an Institute for Resonance Phenomena in southern Germany. His Institute tests the impact of certain products on the human body. 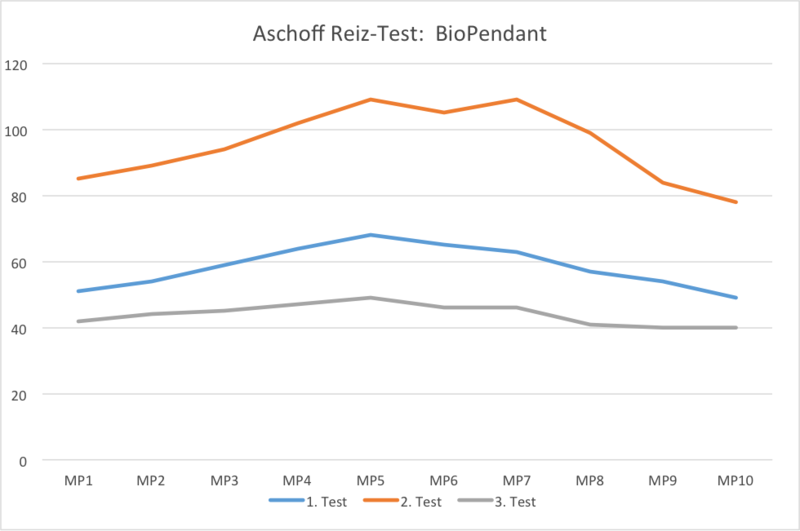 For this he uses the Aschoff Test. 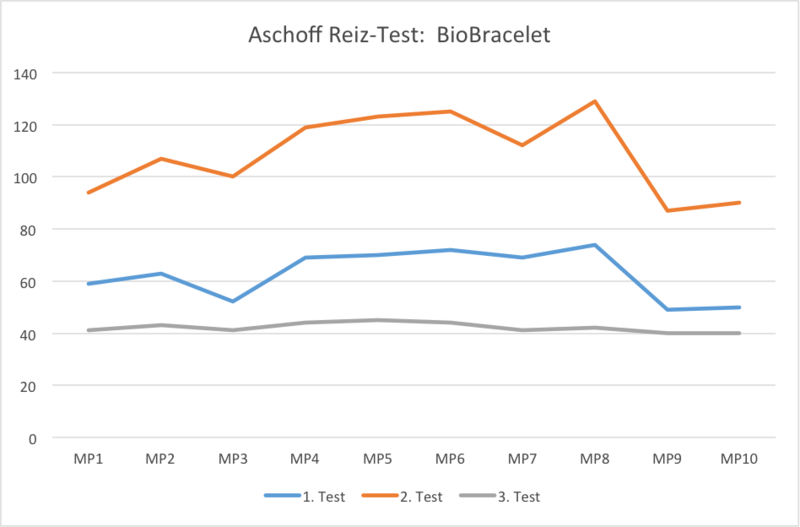 So far the Aschoff test is the only bio-electronic test, which has a German Federal Patent. 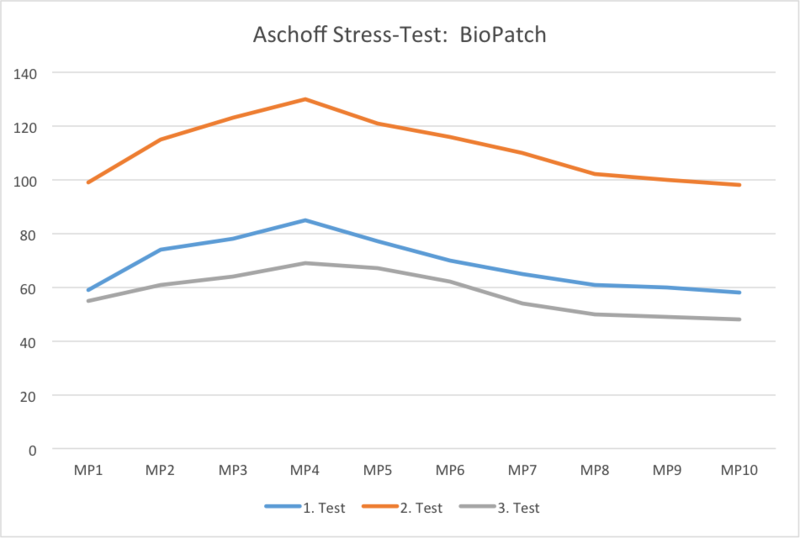 After the patent expires, the family Aschoff has acquired a legal protection of utility patents for the test. Below you can find the complete test protocol. You can also download it as a PDF here. The higher the skin resistance data is, the worse is the bio-energetical condition of the proband. The standard value of a healthy person runs at about 40 kilo ohm. But this value is generally not achieved. Usually the value is up to 60 – 70 kilo ohm. MP 1 – 10 are the 10 metering points on the fingers. The first reading already shows the proband’s (64 year old male) exposure to pathogenic sources of irritation, because the measured data is above the normal standard of 40 kilo ohm. These sources have been be traced back to electromagnetic fields and earth rays. At the second reading the proband is exposed to extensive electromagnetic contamination in form of the high frequency radiation from two mobile phones and the low frequency electromagnetic field of a current-carrying electrical wire. The red line in the graph shows a significant increase of the skin resistance, which implies a strong health risk. 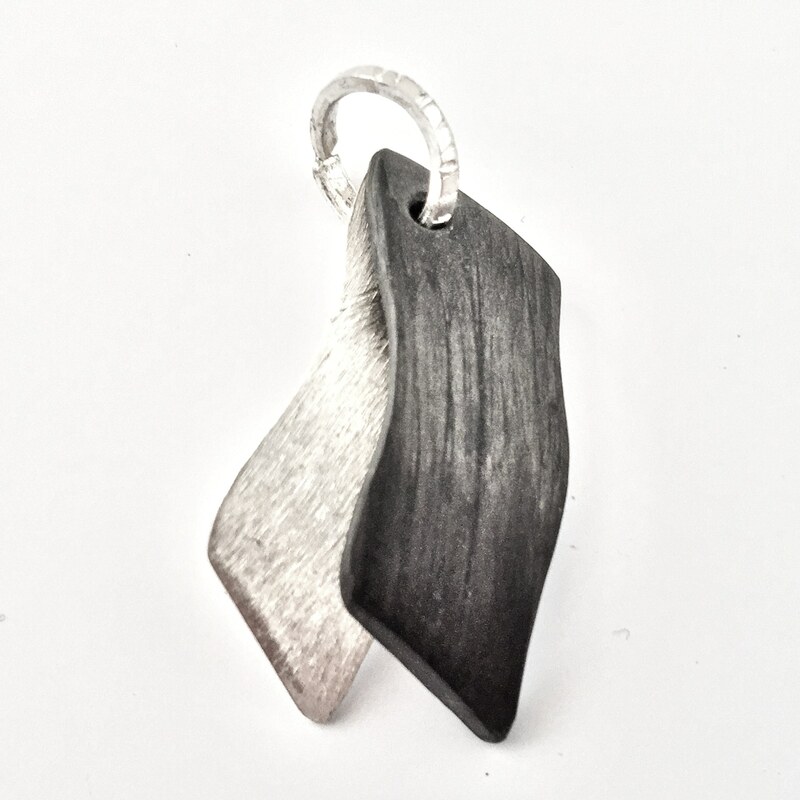 The Body Card made by SWISS HARMONY generates a healthful energy field, which completely neutralizes the bad effects from electromagnetic energy fields (E-smog). 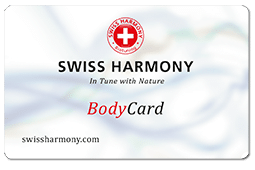 The Body Card by SWISS HARMONY is a very valuable bio-energetic device. The first reading shows only a slight divergence of the general skin resistance value of 40 kilo ohm. 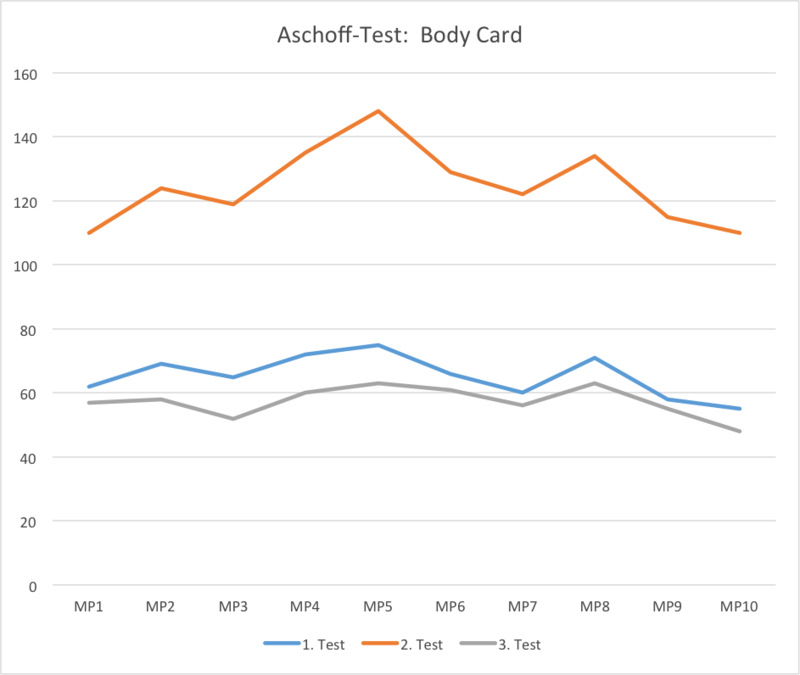 This is probably based on the fact, that the proband has been continuously carrying the Body Card since the last test from the day before. This fact has very likely stabilized the bio-energetic field of the proband. 3 hours before this BioRing- test was done, the Body Card was removed from the proband but his energy-field somehow remained stable, which indicates a general stabilization of the proband’s bio-energetic body field by continuous use of SWISS HARMONY devices. 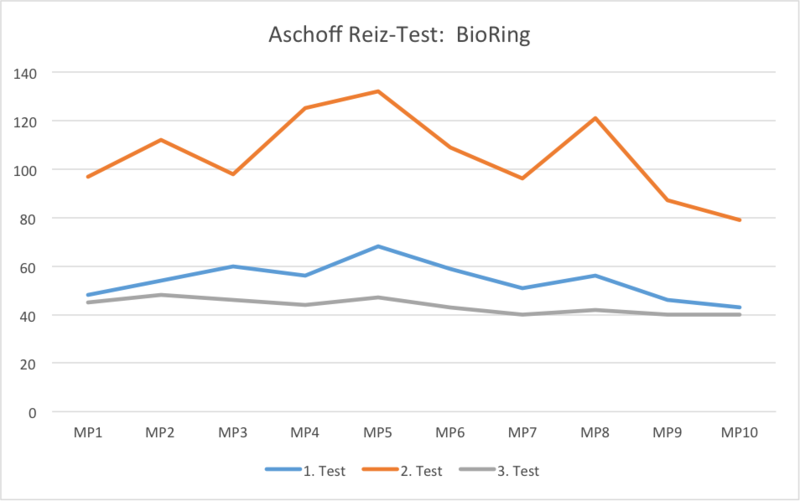 The measured data of the third reading is remarkable low even though the proband is still exposed to the same electromagnetic contamination as at the second reading — but with the difference of carrying the BioRing on his finger. The measured data almost reach the normal value of 40 kilo ohm. This allows only one conclusion: The continuous application of SWISS HARMONY products leads to a general stabilization of the user’s bio-energetic body field. Swiss Harmony BioPatch helps with electrosmog. The first reading already shows the proband’s (21 years old male) exposure to pathogenic sources of irritation, because the measured data is above the normal standard of 40 kilo ohm. These sources have been be traced back to electromagnetic fields, which is no surprise, because the proband is a student of computer sciences, who is spending 12 hours daily in front of his computer. The BioPatch made by SWISS HARMONY generates a healthful energy field, which completely neutralizes the bad effects from electromagnetic energy fields (E-smog). 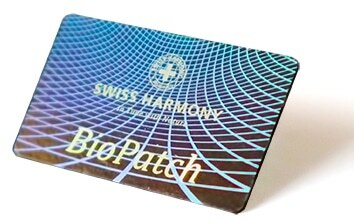 The BioPatch by SWISS HARMONY is a very valuable bio-energetic device. The first reading already shows the proband’s (64 years old male) exposure to pathogenic sources of irritation, but the measured data is acceptable and there is no reason to worry. The standard value of 40 kilo ohm is only a little exceeded. The BioPendant made by SWISS HARMONY generates a healthful energy field, which completely neutralizes the bad effects from electromagnetic energy fields (E-smog). The BioPendant by SWISS HARMONY is a very valuable bio-energetic device. 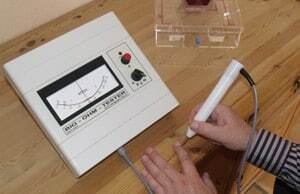 The first reading shows only a clear divergence of the general skin resistance value of 40 kilo ohm. This is probably based on the fact, that the proband has been on a longer car ride just before the test, what lead to the increased measured data. This shows how high and wearing the stress in a car is. 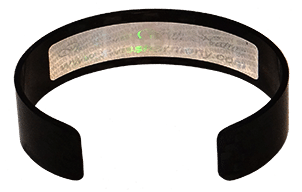 The BioBracelet 2.0 made by SWISS HARMONY generates a healthful energy field, which completely neutralizes the bad effects from electromagnetic and other pathogenic energy fields. 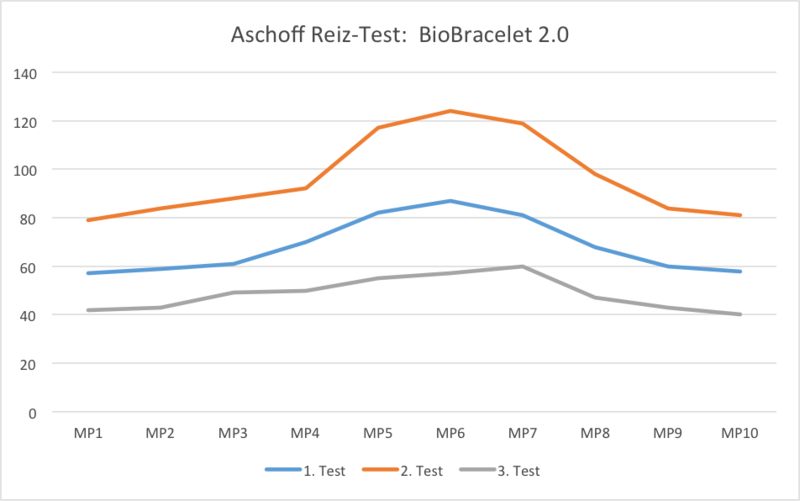 The BioBracelet 2.0 by SWISS HARMONY is a very valuable bio-energetic device. The first reading shows only a clear divergence of the general skin resistance value of 40 kilo ohm. The first reading already shows the proband’s (64 years old male) exposure to pathogenic sources of irritation, because the measured data is above the normal standard of 40 kilo ohm. The sources for this fact have been be traced back to electromagnetic fields. 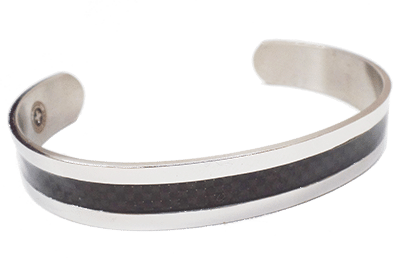 The BioBracelet made by SWISS HARMONY generates a healthful energy field, which completely neutralizes the bad effects from electromagnetic and other pathogenic energy fields. The BioBracelet by SWISS HARMONY is a very valuable bio-energetic device.